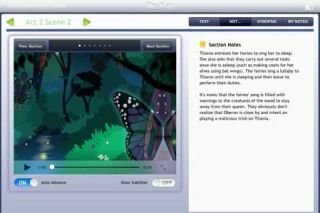 Pros: Side-by-side text and animations, as well as subtitles, help students connect the text and video; analyses make understanding the text easier. Cons: Some students may rely on the scene summaries and other analyses instead of actually reading the play. Bottom Line: Numerous supports, including cartoons, audio, and paraphrased passages, help students understand one of Shakespeare's most popular and most confusing comedies.